VEGASHERO online casino - 200% up to $/€/£1,000 + 200 Free Spins! Say hello to your Vegas-odyssé! 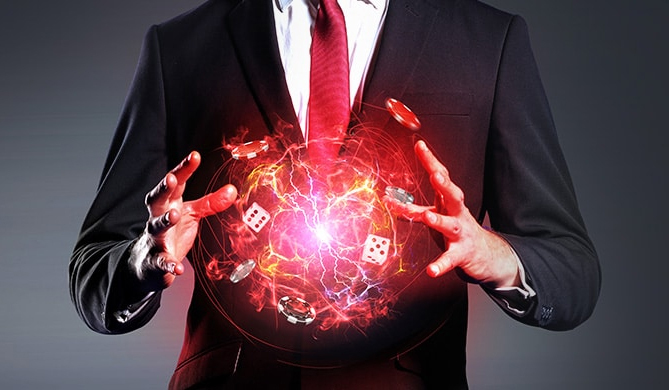 VEGASHERO online casino has done what every other casino has tried to avoid, which is creating a casino that actually looks like a casino, with all the things that makes a casino distinctive. Say “Casino”, answer “Vegas” say “James Bond” answer “Classy hero guy”, say “Classy hero guy” answer “Casino”. It’s the complete circle! The hero in this case is a well groomed and well dressed man, posing in front of the city of Las Vegas. VEGASHERO online casino is a sturdy and clean casino with remarkable quality on table games and video slots. Further below you will be introduced to a video clip of some VEGASHERO gameplay as well as additional information about the casino. 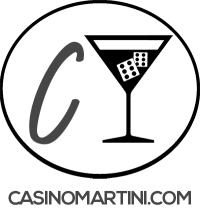 VegasHero online casino has done what every other casino has tried to avoid, creating a casino that actually looks like a casino, with all the things that makes a casino distinctive. Say “Casino”, answer “Vegas” say “James Bond” answer “Classy hero guy”, say “Classy hero guy” answer “Casino”. It’s the complete circle! The hero in this case is a well groomed and well dressed man, who you can’t really hate to look a bit cheesy. He will join you through the experience, wether you like it or not. 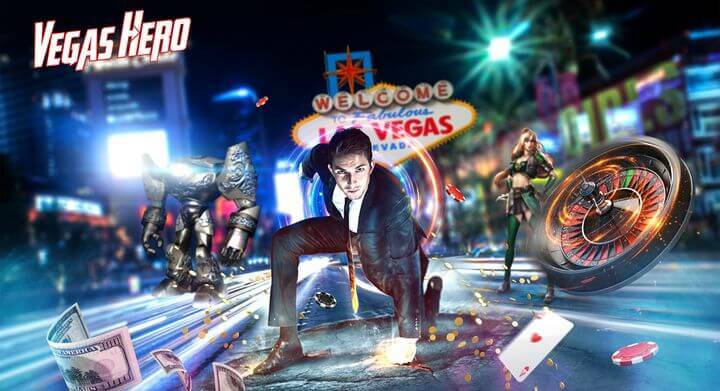 VegasHero has a lot of different types of games to offer, and this is a casino that is not mainly focusing on slots – like most other casinos out there. They even flag with their Live Casino on the front page. You will have an awesome welcome bonus upon registration at €1,000 as well as 50 Free Spins. The bonus is, of course not just handed out as cash, there are some requirements you will have to fulfill in order to make money out of the bonus. As shown below, the bonus is divided out over four different bonuses, and every bonus you claim from the different deposits gives you a matching bonus up to a certain amount. As shown, the bonus is divided over four different bonuses, and every bonus you claim from the different deposits gives you a matching bonus up to a certain amount. For example, the first one is 100% up to €200, which means that if you deposit €200, you will have €400 to play for. And the third one gives you €450 to play for if you deposit €300. The Free Spins will be distributed on the first 5 days with 10 Free Spins each day after your first deposit. The maximal withdrawal you can make from the Free Spins is €200 and you will, as we will go in to a little deeper, need to meet the wagering requirement in order to make the “bonus money” into “real money”. A wagering requirement is at every casino always included in the deposit bonus. Some online casinos sometimes offer no-wager Free Spins for UK players where every winning is directly turned into cash, but as a trend shows, the Free Spins wagering is more often than not the same as the deposit bonus. The reason there is a wagering requirement is that a casino isn’t in the business just to hand out money for people to just put in their pockets. At VegasHero, you will have to wager your deposit bonuses x40 times before you can withdraw them from your account. You also have to meet the wagering requirement within 14 days of your deposit in order to make use of any winnings you make from the bonus money. You will also want to play your bonus money on slots since they are the only game that gives you a 100% wagering contribution. VegasHero also has a weekly bonus each Tuesday that gives you 25% up to €100 but note that you only can have one bonus active at any one time. Also join the “Never miss a Hero” offer in order to have the chance to win more Free Spins, exclusive promos, cash drops and even deposit bonuses. The bonuses will keep coming as you advance in your gambling and becoming a VIP member. the word they use to describe the advantages is “Super-ior Hero Advantages”, but I will never use that phrase again. As a VIP member, you will get your own personal account manager who will help you with whatever inquiry you might have. You will even get a Birthday present. VegasHero gives you a pretty long list of game developers, for the one that just wants to click on a game and play it, this might not be useful information, but if you know every ins and outs of every game developer and which games they host, feel free to bask in the following developers 2 by 2 Gaming, Aristocrat, Elk Studios, Evolution Gaming, Lucky Streak, Microgaming, NetEnt, Next Gen, Nyx Interactive, Play’n GO, Quickspin. Their Live casino is powered by Evolution Gaming, which offers state of the art quality to the Live table games. When it comes to games, VegasHero offers both the traditional slots as well as video slots with plenty of pay lines. The usual table games that host Black Jack, Baccarat, Roulette and Poker games. The live casino offers are pretty vast and are representing the whole theme of VegasHero’s concept. You can also play progressive Jackpot slots such as Microgaming’s Mega Moolah, which can let you win millions. There is also some video poker games for you to take part in. A well designed mobile site is also available for VegasHero if you wish to play slots or a small selection of table games through your iPhone or Android device.. Registering an account was a very simple process, and I only required a minute or so to punch in my personal information to get set up. If you ever need help along the way, you can easily reach VegasHero’s professional and friendly support team. 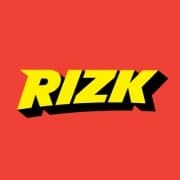 You can reach their customer support through phone, live chat and email. They also have a FAQ for more frequently asked questions. Once entered, you’ll be welcomed by an action-packed Las Vegas with a James bond-kinda guy in the front that adds a true casino feeling! The cityscape in the background has all the distinctive landmarks connected to Vegas. They have really scraped off all the unnecessary elements and keeps everything boxed up so that the webpage is perspicuous and very friendly for the eye. You will have a clear registration box as well as two boxed, one that shows recent winnings and one showing the current jackpots. When scrolling down just a bit, you will be presented to the Live Casino, and not the slots! This is really nice considering that everyone that joins an online casino can pretty much already figure out that there will be slots. The minimalistic website is in the theme of white with distinctive red details. You will also be able to browse through the website with the left side menu bar. 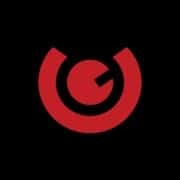 VegasHero is operated by Genesis Global Ltd from Malta, which incorporates both the laws of Malta as well as licensing and regulation by the Malta Gaming Autohority (MGA). 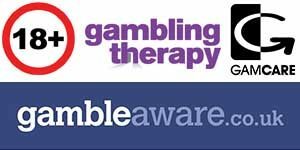 For UK players, they are also regulated by the UK Gambling Commission (UKGC). VegasHero also uses the Secure Sockets Layer (SSL) in order to keep all of your financial and personal information encrypted and secure from any one unauthorized third party. SSL is used by pretty much every big bank in the world, so you should take comfort in that your personal and financial information is as secure it can be. 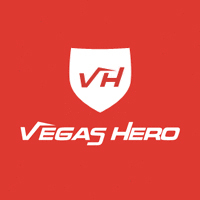 VegasHero will only need your personal information in order to verify your age. So they will need you to provide documents that show your age as well as your home address. 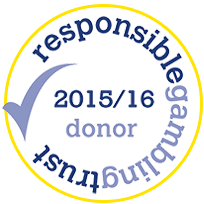 VegasHero do offer players help to keep their gaming under control, often referred to as responsible gaming. This can be done in a number of ways, for example through adding different kinds of deposit limits, Loss limits, Wagering limits as well as a reality check as options on their accounts. The reality check lets you be reminded on exactly how long you’ve been playing for as well as how much you have won/lost. There is also the self-exclude option, where you can “ban” yourself from accessing your account. This can be done up to a five year period, and if you would like to lift the ban, you will need to endure a cool off period of 7 days to prevent you from doing anything that you might regret. They also share their opinion about filtering options which you can use on your computer. This is to protect other users from accessing a casino. For example, if you have an underage in which also uses the computer. They suggest that you use Net Nanny and CyberPatrol for this kind of filter. VegasHero offers you a ton of deposit options and almost as many withdrawal ones. There is no fee in withdrawal, which is nice. They claim that withdrawal times are instant for E-wallets, 1-3 days for debit cards and 3-5 for bank transfers. The maximum transaction for deposits are €5,000 and the maximum transaction for withdrawals is €2,300 with a minimum of €10. 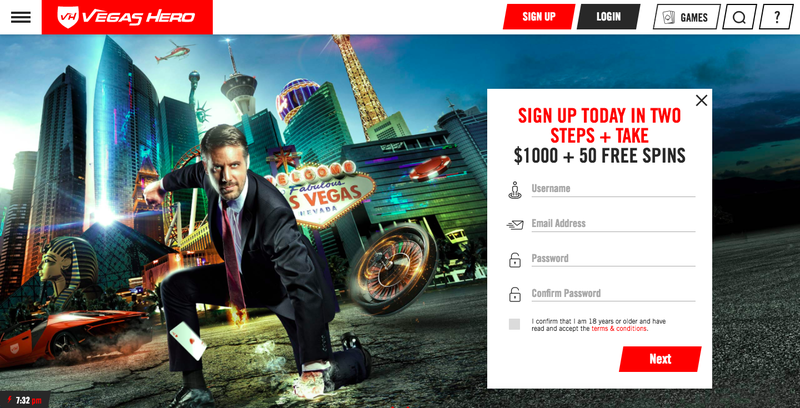 VegasHero has niched itself to represent the atmosphere of Las Vegas casino gambling. Its enough familiar for everyone to immediately associate them with a casino. 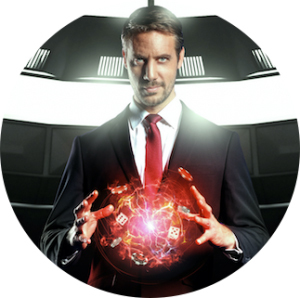 The creators have a strong brand and experience in designing this type of online casino, so they do it with aplomb. They offer a big four step bonus deposit bonus that includes Free Spins, and the wagering isn’t that high either. 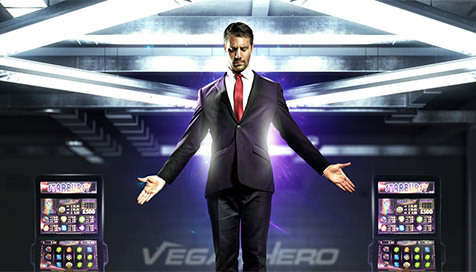 VegasHero offers quality in both slots, table games, and live casino. It clearly shows that they have put a lot of focus on range and quality on their video slots. You should really try VegasHero out, mainly because they have a good working deposit bonus that gives you a really good start in your gambling experience. The Extra Spins are required to be wagered before any winnings can be withdrawn, so you can’t just peak your head in and opt out with any amount of cash. 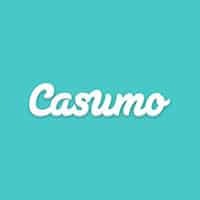 They feel like a sturdy and robust casino where you just expect everything to work, this might be a result of the very clean navigated site and it’s very good loading speed.